K75 the next king of throw? Searchlights used in rescue operations have mainly been Non-Led flashlights until recently. But since LED has gained so much popularity and technological improvements we now have entered an era with LED flashlights overtaking the traditional searchlights. Especially for daily use. They can run much longer on less battery. It's not ucommong to have a far reaching flashlight running for 1 hour with only 4 batteries! I found the following picture on the Russian Acebeam website. I haven't seen a price yet. The whole long-range LED flashlights started a long time ago. But in 2016 Budgetlight forum member collaborated with Lumintop to make the first 1Mcd+ LED handheld flashlight. The flashlight was released towards the end of 2017 and called the Lumintop BLF GT. A few months later Astrolux (banggood brand) entered the market with the Astrolux MF04, overtaking the BLF GT by a fair margin, at least according to my own tests with my own samples, but running off only 4 batteries instead of 8 in the BLF GT. Seeing your competitors entering a highly demanding flashlight category (far reaching flashlights) Acebeam just couldn't stay behind, and had to come up with an alternative.. Althought almost 1 year after the BLF GT became available, they copied the succesful BLFGT and Astrolux GT with their own far reaching thrower, the Acebeam K75. I reviewed the much less-far-reaching Acebeam K65 a while ago, I'm very interested in seeing if this bad boy will surpass them. Acebeam is a high quality brand that doesn't storm the market with premature products like Imalent. So at least I can imagine the K75 being a high quality flashlight with good quality components. But I don't know if what they claim is actually true, having 2600 Lumens and 1.2Million Candela. Only time will tell, and hopefully I can get my hands on 1 copy to test. 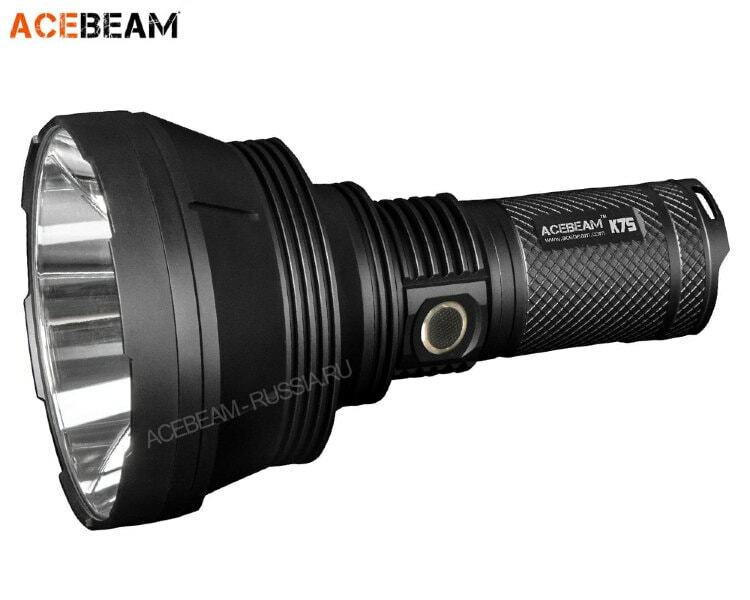 Acebeam hasn't posted the K75 on their official Acebeam website yet, so we don't know the MSRP price yet.